But why should I feel obligated to enable my son to bond with his teammates over high fructose corn syrup, trans fatty acids, and artificial colors? Why is that the new normal? Why am I the bad guy for trying to protect my child from the deleterious effects of eating C.R.A.P. (Calorie Rich And Processed food, according to my dear friend Chef AJ)? As a dietitian, I am used to seeing the consequences of food on people’s health. I see people with excess weight, high cholesterol, high blood pressure, excess weight, type 2 diabetes, autoimmune disease, etc. on a regular basis. I also have had the fortune of watching these same people restore their health, control their weight, and reverse chronic disease by changing the composition of their diet. This is the nature of the biz…. …But as a Mom, however, I have officially reached the apex of excruciating frustration…. I was put over the edge recently, when my son was handed a snack pack of oreos and goldfish crackers with a bag of juice-like liquid as the post-game snack, dutifully provided by another kid’s Mom. Being the neurotic, over-concerned Mom/Dietitian that I am, I quickly snatched the items out of my son’s hands and snuck them back in the other Mom’s bag before she even noticed what happened. Yes, that may have been a reaction that was beyond rude and I did cause my son to cry and feel deprived. My husband all but cursed me out and blamed me for making our kid the one person on the team who was left out. I have even been accused of “forcing my beliefs” onto my children unfairly, since I happen to be a passionate advocate for a whole food, plant-based diet…But this issue is not ethical nor is it unfair. It stretches beyond plant-based versus non-plant-based and it is – in fact – a matter of life and death. We are killing ourselves and our children with the foods we are eating and providing our families. Is it because we don’t have the information? Is it because we think a little bit can’t hurt? Is it because so called health food is not available or is too expensive? Or is it because we see this standard American diet as normal? After years in the health industry, I am betting it is a little bit of all of these reasons. But I also believe that the last option predominates. Normal is as normal does and our idea of normalcy has shifted with our growing landscape of increased chronic disease and obesity. Because children are growing at such a rapid rate, their bodies react even more dramatically to assaults from toxins than adults do. They are more vulnerable to this incessantly continuous dosing of toxicity. Researchers predict that more than half of the population in the United States will be obese by the year 2030. Diabetes incidence is rapidly increasing in children. Behavioral disorders, like ADD and ADHD, are dramatically higher than ever before. Is this the normal we want to adapt to? We have been…as we make larger airline seats, hospital gurneys, and even coffins to compensate for the new normal size. Send your child to school with homemade lunches and/or demand your school cafeteria provide healthful whole options that look appealing to a child’s picky gaze. For a bunch of ideas on my favorite healthy snacks for kids and more ideas of packing a healthy lunch, visit my website. Opt for nourishing post-game/workout snacks like fruit and water. Or, if you want to fancify it, try coconut water and a healthy bar. For delicious and more creative snack ideas, check out blogs like Plant-Powered Kitchen, Lunch Box Bunch, or Oh She Glows. Talk to your kid’s teachers and band together with other parents to choose treats other than food for birthdays, holidays, and as rewards. 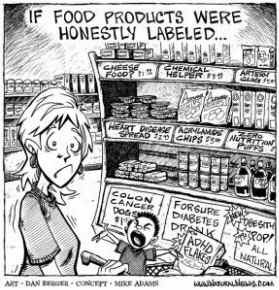 Ignore everything on a nutrition or food label except for the ingredients. If you can’t pronounce it or if there are more than a few (4-6-ish) ingredients, put it down and walk away. Educate yourself about nutrition myths and intentional misleading initiated by the food industry. Excellent authors on food policy topics include: Michele Simon, Andy Bellatti, and Marion Nestle. Share this information with your peers, friends, teachers, kids, coaches, family, and anyone involved in your family’s world. Remember that food habits and culture are fundamental to a person’s identity. It all begins in the home and the tone is set for life beginning during childhood. Role model and institute the new archetype. As Gandhi so gorgeously iterated…Be the change you want to see in the world.